i am completely alarmed that the last pair of jeans is not that fit anymore. needless to say: i have grown fat. frustrated by the fact and of course by what the little self-esteem that's left of me. i consulted my ever trusting BMI or Body Mass Index to check whether this is still acceptable or not. 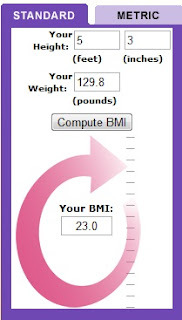 BMI is a way of computing body measure by using body length and body weight. my result was 23. i am still at normal weight. i can say that this is just an exaggeration. knowing that i only have one pair of jeans is really my idea of good news. it not only tell me to buy new ones but it also encourages me now to be choosy and be picky on what i eat or what i don't. not when the holidays is yet to come! guess id start the new year right by eating right. here are few tools to check for your BMI. if in doubt and you need a second opinion, just in case the truth still hurts i made sure to give you more links in case you are still in denial. let's pray that the calculator is kind.